Although technically a lake, it has the look and feel of a river. Since the completion of Table Rock Dam in 1958, the physiology of the lake changed to a cold water fishery. Lake Taneycomo now has a reputation as one of the finest trout fishing reservoirs in the nation. The cold, clear water combined with the Shepherd of the Hills Trout Hatchery has made it the perfect spot for rainbow and brown trout. About 80% of the 1,200,000 trout raised at the hatchery each year are released into Taneycomo. 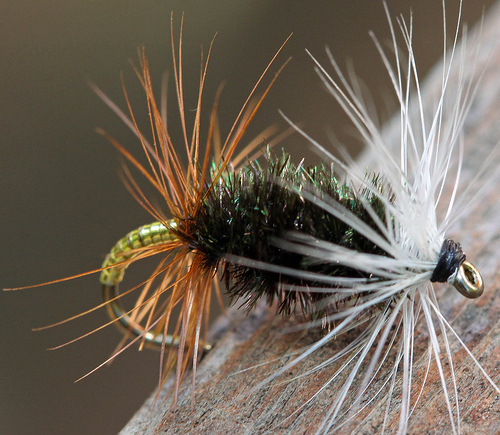 The upper 3 miles is a favorite for fly-fishing and waders. There is an artificial lure only regulation along with slot length limit on rainbow trout. The rest of Taneycomo has no length restrictions for rainbow and anglers can use any type of bait under state wide regulations. Fishing continues to be great as you float down Lake Taneycomo past Rock-a-way Beach and to its end near Forsyth at the Powersite Dam. Warning:When fishing near the Table Rock Dam from the shore or particularly when wading in, pay attention to the horn when it blows. This is a warning indicating that they are going to start generating power. This will cause a sudden increase in the speed of the current and depth of the water. The water can rise feet in a matter of minutes. Note: The majority of the shore on Lake Taneycomo is private property; shore fishing is limited to the public land in state and municipal parks along the shoreline. Additional shore fishing is available at the many trout docks located along the lake. Call the specific resort or trout dock to check their availability. Out-of-state anglers should check with the Missouri Department of Conservation for needed permits. From Fall Creek on down stream the majority of anglers will fish live and prepared baits. While fly fishing still takes place, the majority of fisherman utilize a �Taneycomo Drift Rig� with live night crawlers, red worms or assorted colors of Berkley power bait eggs and nuggets on casting or spinning equipment. Boating anglers will run up stream a few miles from their launching point and then control the drift back against the current making casts to deeper pools and wood cover along the banks. Productive lures in this area include; twitch baits like Rapalas and Lucky Craft pointers, small spinners like Rooster Tails, Mepps, Super Dupers and Panther Martins or small crankbaits such as Norman Crappie Crankbaits or Yozuri Snap Beads. The �Taneycomo Drift Rig� will also work as you drift down the lake, simply cast and allow the rig to bounce the bottom. This portion of the lake also holds all of the public and private trout docks. Most anglers fishing from the docks will fish on the bottom or with a float around the dock with either live or prepared baits. Click map for another map of Taneycomo and the surrounding area. Lake Taneycomo (short for Taney County Missouri) was created in 1913 when the White River was captured by the newly constructed �Power Site� Dam, near Forsyth, Missouri. 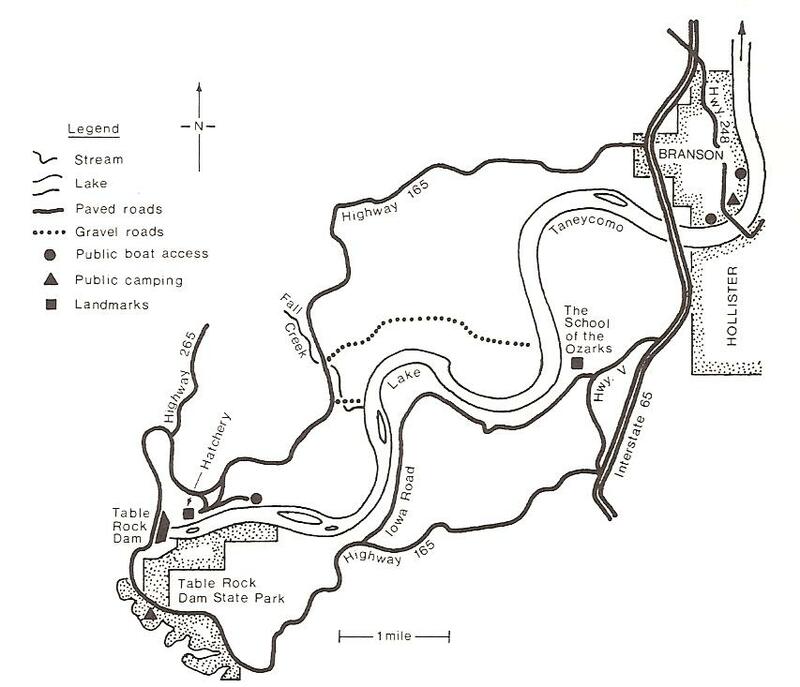 The completion of Table Rock Dam in 1958, 22 miles upstream, created a southern boundary for the Lake which now consists of over 2,080 surface acres. Unlike the Table Rock and Bull Shoals Dams and Lakes, which are owned by the U. S. Army Corps of Engineers, the Power Site Dam is privately owned by Empire Electric Company. This company holds a license to continue operating the Dam and its hydroelectric plant until 2022. From 1913 until 1958 Taneycomo was a �warm water� lake, but when Table Rock Dam started feeding Taneycomo, the water coming through the �power generators� was significantly lower in temperature. Virtually overnight, a �cold water� fishery was created. To take advantage of this change, the Missouri Department of Conservation constructed the �Shepherd of the Hills Trout Hatchery� at the foot of the Dam. When power is not being generated, Lake Taneycomo exhibits characteristics of both a river and a lake. The shallow, colder water at Lake Taneycomo Mile Marker 22, located adjacent to the Junction of State Highways 165 and 265 near the Table Rock Dam, averages 48 degrees F, resembles a river and permits wading and bank fishing for trout. The average temperature of the water gets warmer as the lake sinks to depths in excess of 50 feet near Lake Taneycomo Mile Marker 1 and the Power Site Dam in Forsyth. When Table Rock Dam is generating power its current is very strong throughout its whole length, its water temperature drops, and for all practical purposes it becomes a very deep, cold, fast running river. Exactly how deep, cold, and fast depends on how many generators are being used to generate electricity at Table Rock Dam.